Heat oven to 350°F (325°F for dark or nonstick pans). Grease bottoms and sides of four 8-inch round cake pans with shortening. In large bowl, beat cake mix, milk, melted butter, eggs, cinnamon and nutmeg with electric mixer on medium speed 2 minutes. Stir in carrots and pecans. Spoon and spread batter evenly in pans (about 1 1/4 cups batter each). Bake 18 to 22 minutes or until toothpick inserted in the center comes out clean. Cool 10 minutes; remove from pans to cooling rack; cool completely, about 1 hour. In large bowl, beat cream cheese and softened butter with electric mixer on medium-high speed until smooth. Beat in 1/4 cup caramel sauce and the vanilla. On low speed, beat in powdered sugar, 1 cup at a time, until smooth and creamy. Frost cake using 2/3 cup between layers. Frost sides with a thin layer of frosting so sides are covered but still showing through. Spread remaining frosting on top. Refrigerate uncovered at least 2 hours. 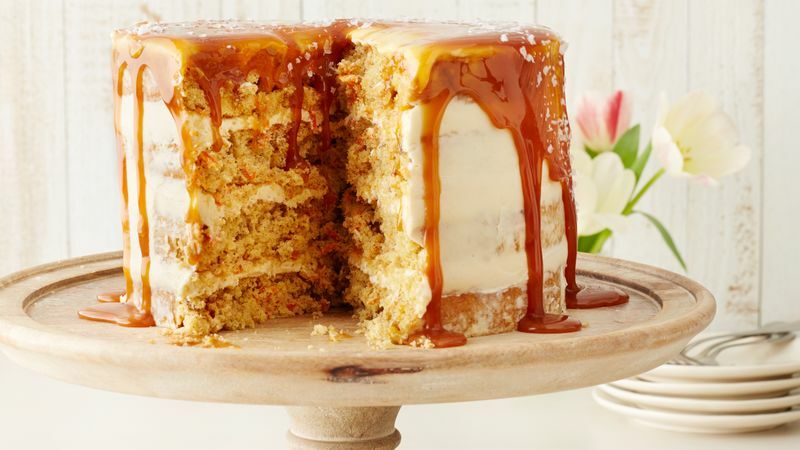 When ready to serve, carefully pour and spread 1/3 cup caramel sauce over top of cake, allowing some to drip down sides; sprinkle sea salt on top. Cover and refrigerate any remaining cake. The “half-dressed” or thin layer of frosting on the outside of a cake allows the layers to show through. It’s impressive and easy! If you can't fit all four pans in the oven, refrigerate remaining batter until others are baked, and then bake remaining layers separately, adding a little extra time if needed for baking refrigerated batter.